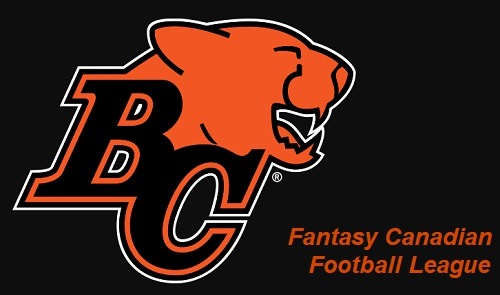 The BC Lions are a Fantasy Canadian Football League team which was formed in June 2018. They play in the Leaf Division of the FCFL, was was created in May 2018. The team is named for the Canadian Football team, the BC Lions, which is headquartered in Vancouver, British Columbia, Canada. The fantasy Lions are based out of a Portland, Oregon (U.S.A.) suburb. The team will also be operated from its satellite office in Boise, Idaho during the latter part of the season. 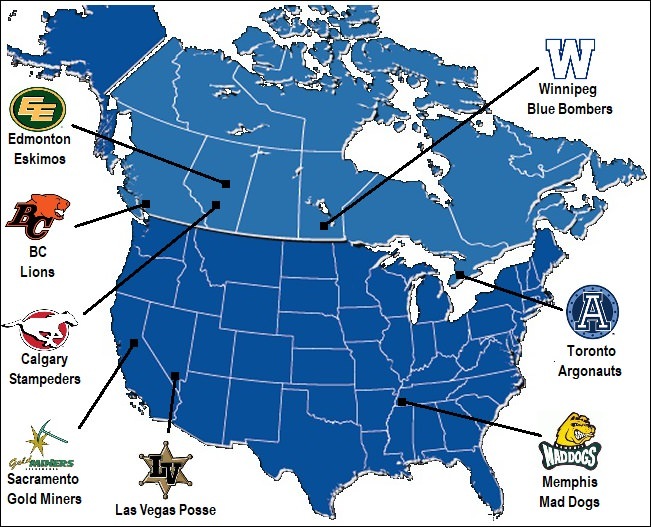 The FCFL plays its games using players from the nine CFL teams. The fantasy league will begin its regular season during week 6 of the CFL season (effectively, the week of July 19-22). Eight teams make up the FCFL, forming two divisions, the Maple and Leaf. The inaugural draft was held over a multi-day span beginning July 10. The draft was split up into segments, separated by the divisions. 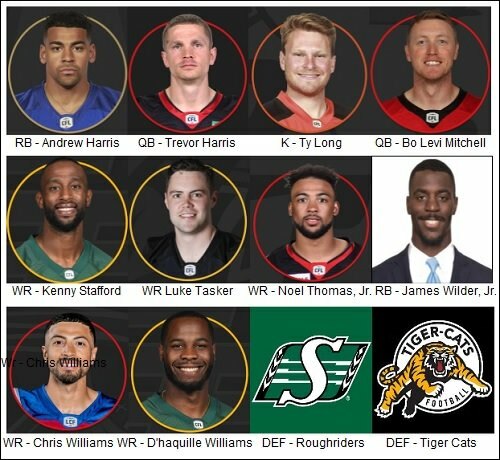 This allowed for teams in each division to select players from the entire spectrum of CFL rosters. Teams in a division could select players which had been selected in the opposite division. However, once a player was taken in either the Maple or Leaf Divisions, that player was off the board in that particular division. Through random draw, the Lions possessed the first selection in the Leaf Division. The selected running back Andrew Harris of the Winnipeg Blue Bombers. Other notable selections included Edmonton Eskimos' wide receiver D'haquille Williams, taken eighth overall (second round), and Calgary Stampeders' quarterback Bo Levi Mitchell, taken ninth overall (third round). The BC Lions are innovative when it comes to technology and have created the FCFL's first media guide blog and thread in July 2018. This page is that blog. The team is run by using a notebook computer, tablet and cellular phone. This enables its executive staff the flexibility in coordinating activities involving both the team and the league; 24 hours a day, seven days a week. The Lions are owned by Angela Martin, a native of the Portland area who attends college in Boise, Idaho. She also serves as the team's General Manager. Martin is also the owner of the Champions Internet Fantasy League's Portland Forest Dragons. 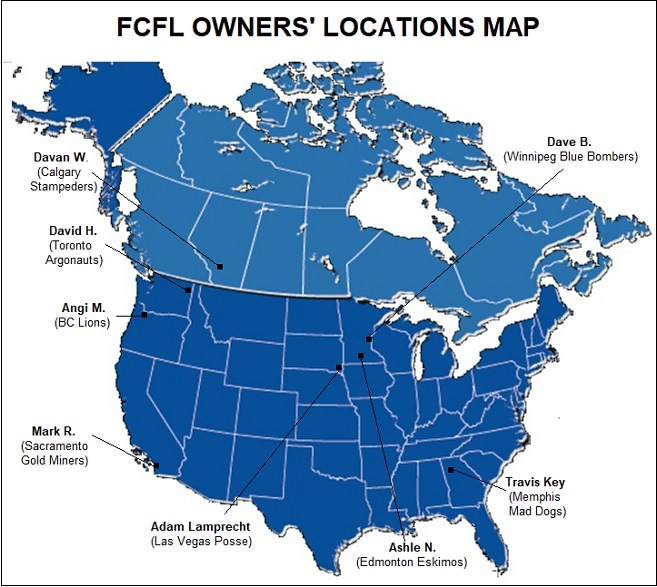 Martin is one of two female owners in the FCFL; the other being the Edmonton Eskimos, owned by Ashle Norling. Martin is about to enter her senior year with a major in communications. On July 8 Martin announced that her youngest sister, Monika, would serve as Director of Player Personnel and Lead Scout for the Lions, identical to her posts with the Forest Dragons. The Lions play their games on the fields the CFL teams' stadiums, and is filtered through Goal Line Software. 6-24 -- Chris Williams, WR, Montreal Alouettes. "We are thrilled to participate in the inaugural season of the Fantasy Canadian Football League. There are a whole new slate of players as well as a few familiar faces we have followed since their college days. It's thrilling to be a part of such an amazing and progressive league. The reason we selected the BC Lions as our franchise was, in addition to the terrific Vancouver people and community, they were the closest geographically. With hectic and busy schedules, we felt that would lessen our commute time to the games. We look forward to competing against the other teams in the FCFL. The only question is, which one of them will we defeat in the Fantasy Grey Cup. This franchise's pedigree is that of a champion. Combine that with the roar of the Lion, and we feel there is no way we can lose. Let's get to it!)." "The Roar of the Lion is our calling card. There is a reason he is considered the King of the Jungle. On the field, we intent to be the Kings (and Queens) of the FCFL Jungle. We will stop at nothing to make the Lion victorious." Rd. 1, Pick 1 -- RB Andrew Harris: "Being afforded the top pick in the draft allowed us to take Andrew off the board early. Our staff was greatly excited to bring him to the Lions as we look to build an offense second to no other in the FCFL. We look forward to establishing our backfield around Andrew." Rd. 2, Pick 8 -- WR D'haquille Williams: "D'haquille was the highest receiver on our draft board so this was an automatic selection for us. His size and strength give him an edge in the receiving game. We're looking for great things out of D'haquille over the course of this season." Rd. 3, Pick 9 -- QB Bo Levi Mitchell: "Bo Levi is an exceptional passer who can make things happen on any given play. We were trilled when he was available with this pick. With the rich history and tradition of football in the state of Texas, we were excited to build our backfield around a native Texan. We're confident our offense will be potent with Bo Levi at the helm." Rd. 4, Pick 16 -- WR Luke Tasker: "Luke has the ability to come up with the catch when needed most. He will be looked upon by the Lions to solidify our receiving corps and to bring consistency in our passing game." Rd. 5, Pick 17 -- RB James Wilder Jr.: "With already having the first overall pick in Andrew Harris, we stacked our backfield with James. During his father's playing days with the NFL's Tampa Bay Buccaneers, James Wilder, Sr. was the best in the league. Judging from his play thus far, James Wilder, Jr. is a chip of the old block." Rd. 6, Pick 24 -- WR Chris Williams: "Chris is an exciting receiver who makes things happen on the field. He was high on our draft board from the get go. We're excited to see what Chris can do for us on the field." Rd. 7, Pick 25 -- WR Kenny Stafford: "With two consecutive picks in the sixth and seventh rounds, we had the ability to bolster our receiving corps. That's exactly what we did. Kenny adds speed and depth to our receiving corps and we could not be more pleased to pick up with this pick." Rd. 8, Pick 32 -- DEF Saskatchewan Roughriders: "With our base offense in tact, we felt this was an opportune time to switch our efforts to the defensive side of the ball. The Roughriders have shown themselves to he quite talented and opportunistic. We're confident this group will be a force to be reckoned with." Rd. 9, Pick 33 -- QB Trevor Harris: "Even as excited as we are to have drafted Bo Levi Mitchell in the first round, we were glad to see Trevor available so late in the draft. While providing depth for Bo Levi, we expect Harris to push our starter and, perhaps earn time on the field at points throughout the season." Rd. 10, Pick 40 -- K Ty Long: "We're happy to add Ty to our roster. He, quite simply, is one of the best kickers out there and we anticipate he can come through to help us win some of those close games. We are looking forward to welcoming him to the Lions." Rd. 11, Pick 41 -- DEF Hamilton Tiger Cats. "This group is a tremendous collection of talent capable of terroizing opposing offenses. This unit will see ample opportunity on the field for us this season and we're looking forward to the contributions they will make to our team this season." Rd. 12, Pick 48 -- WR Noel Thomas: "While this pick was the FCFL's version of 'Mr. Irrelevant,' we see absolutely nothing irrelevant about the potential Noel will bring to our roster. He is an exciting receiver always capable of making the big play." 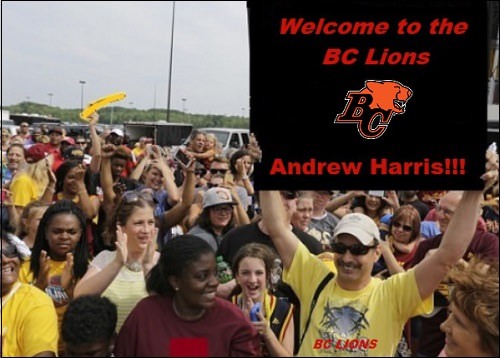 Lions fans gather outside the airport to greet first overall pick Andrew Harris. You've done it again. This is really cool. Good luck this season.